What Does it Mean When a Dog Constantly Pants? Panting is a normal method of cooling down. All dogs pant sometimes -- it's just part of how their bodies work. But if your dog can't seem to control his heavy breathing, it could indicate a health problem. When his panting seems like it just won't stop, it's time to give your vet a call. Dogs sweat, but not as much as people do. They sweat from the pads of their paws, but panting is a much more efficient way of cooling down for a canine. When his jaw hangs open and he breathes heavily, it helps air circulate through his body and cool him off. 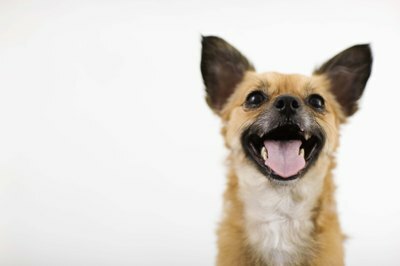 If your dog is panting, it could be because the weather is too warm or he's cooling down from exercise. If he's been resting and still won't stop panting, call your vet. Only you can determine if he's been panting an abnormally long time, so monitor his typical panting behavior so you can gauge what is and isn't normal for him. A variety of illnesses can cause your dog to pant uncontrollably. This could include a respiratory disorder such as pneumonia, a chronic glandular problem such as Cushing's syndrome or even heart failure. These and other conditions are generally indicated by other symptoms, as well. If you suspect that your dog is ill, contact your vet right away. Your dog ages at a more accelerated rate than you do, and depending on his general health, he could start panting as a response to his old age. Weight gain and arthritis can make it more difficult for your dog to get around as he ages, causing him to pant during light exercise. Even a younger dog can develop painful conditions such as arthritis. If your pet seems to have trouble breathing, ask your vet if a physical condition and/or the dog's age is a factor. Heavy breathing can indicate the sudden onset of an allergic reaction. A dog that eats something poisonous or takes a medication to which he is allergic can start panting as a reaction. Look for other symptoms of an allergic reaction, such as vomiting, which can indicate that he has ingested something his body cannot handle. Medication can make your dog pant constantly even if he isn't allergic to it. If your dog is on one of these medications, such as prednisone, ask your veterinarian for advice. Web MD: Why Is My Dog Panting Heavily? Pet MD: Why Do Dogs Pant? What Does It Mean When Your Adult Cat's Fur Is Changing Color? What Does It Mean When a Dog Rubs Its Head on the Floor? What Does it Mean When a Dog Is Tilting His Head? What Does It Mean When a Cat Waves His Tail From Side to Side?